Michigan is coming off a disappointing 8-5 season in 2017, and Jim Harbaugh enters a pivotal fourth year with the Wolverines. The most-heard criticisms of Harbaugh are his inability to finish higher than third in the Big Ten East Division and Michigan’s 1-5 record against rivals Michigan State and Ohio State. It won’t be easy to silence the critics against a schedule that features four top-10 opponents, but Ole Miss transfer quarterback Shea Patterson could help if ruled eligible by the NCAA. Regardless, the entire offense needs to be better for the Wolverines to deliver a better finish in 2018. 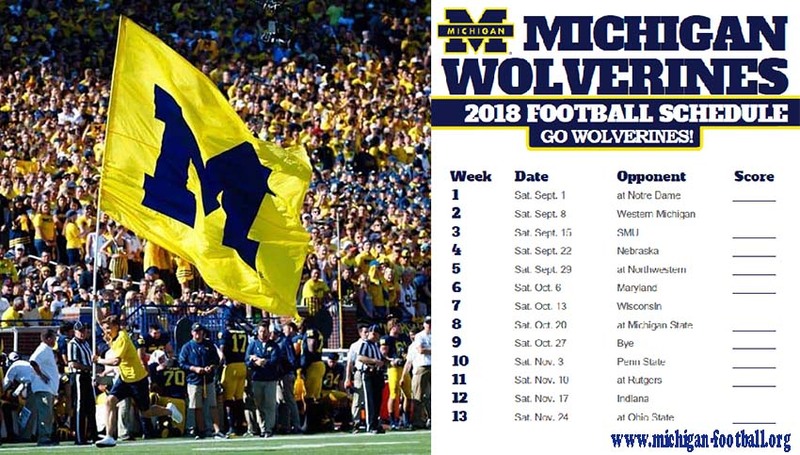 Michigan Football opens the season ranked No. 12 in Sporting News’ updated way-too-early top 25 thanks to Patterson’s presence. Michigan has the talent, especially on a defense led by defensive coordinator Don Brown and defensive studs Rashan Gary and Chase Winovich. April 14 Michigan spring game Ann Arbor, Mich.
Sept. 1 at Notre Dame Notre Dame, Ind. Sept. 8 Western Michigan Ann Arbor, Mich.
Sept. 15 SMU Ann Arbor, Mich.
Sept. 22 Nebraska Ann Arbor, Mich.
Sept. 29 at Northwestern Evanston, Ill.
Oct. 6 Maryland Ann Arbor, Mich.
Oct. 13 No. 6 Wisconsin Ann Arbor, Mich.
Oct. 20 at No. 16 Michigan State East Lansing, Mich.
Nov. 3 No. 10 Penn State Ann Arbor, Mich.
Nov. 10 at Rutgers Piscataway, N.J.
Nov. 17 Indiana Ann Arbor, Mich.
Michigan’s 2018 class ranked No. 21 according to 247Sports’ Composite team rankings, a drop-off after back-to-back top-10 classes. Four-star quarterback Joe Milton (Olympia, Orlando, Fla.) is already on campus, and the class also features four-star impact players in defensive end Aidan Hutchinson (Divine Child, Dearborn, Mich.), linebacker Cameron McGrone (Lawrence Central, Indianapolis) and tight end Mustapha Muhammad (Ridge Point, Missouri City, Texas). Don’t be surprised if those three see early playing time. Michigan is waiting for a ruling on Patterson, a former five-star quarterback who showed play-making ability at Ole Miss the last two seasons. Michigan quarterbacks Wilton Speight, John O’Korn and Brandon Peters combined for 2,023 yards, nine touchdowns and eight interceptions in 2017. Peters will compete for the starting job along with redshirt-freshman Dylan McCaffrey, but this is the most depth Michigan has had at quarterback since Harbaugh arrived. This is the position where the Wolverines have lagged behind the Buckeyes most. 2. What about the rest of the offense? Quarterback isn’t the only issue: A group of young receivers led by Tarik Black and Donovan Peoples-Jones must take the next step as well. Running back Karan Higdon finished with 994 rushing yards and 11 touchdowns last year, but the Wolverines couldn’t run the football in big games. The offensive line needs to be better at every position, and a well-compensated offensive staff must deliver. That means more from offensive coordinator Tim Drevno and passing game coordinator Pep Hamilton. Michigan reportedly is bringing on former Florida coach Jim McElwain as an assistant coach as well. The Wolverines ranked 91st in the FBS in scoring offense last season (25.2 points per game); that simply can’t happen again. 3. How many wins beats the heat? Look at that schedule one more time. Michigan plays at Notre Dame, Michigan State and Ohio State. Since Lloyd Carr retired after the 2007 season, Michigan is 2-12 on the road against those teams and the Wolverines haven’t won in Columbus since 2000. On top of that, the home schedule features Penn State and crossover games against Nebraska, Northwestern and Wisconsin. It’s brutal, but at least five of the first seven games are at home. A 10-win season would silence some critics, but it’s never about the wins with Harbaugh. The losses get much more attention.